First of all I'd better explain how to get to the Ben Lawers hills. If you're coming from the south, take the M9 north to Stirling. 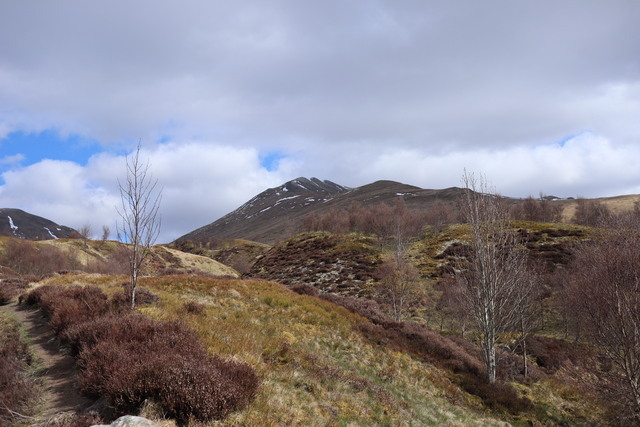 Then follow the A84 which goes from Stirling to Crianlarich. Go through Callander, Strathyre and Lochearnhead. After Lochearnhead the road climbs steeply up and over the pass at the head of Glen Ogle. It then descends into Glen Dochart, at the bottom of the hill the main road takes a sharp left turn. There's a garage here selling 4x4's (The Lix Toll Garage). Turn right onto the A827 sign posted “Killin”. At Killin cross the river Dochart, there are spectacular white water rapid and a waterfall right under the bridge, well worth stopping for a look. Go through the village and along the side of Loch Tay for about 4 miles. 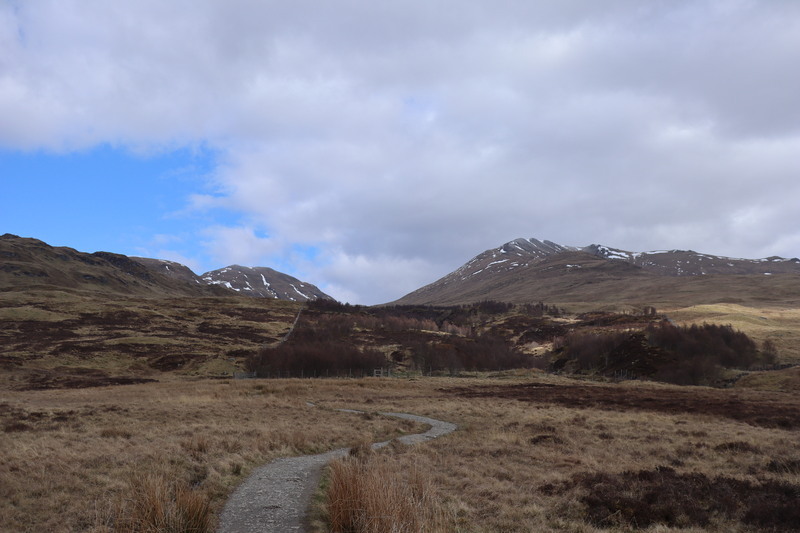 Take the single track on the left sign posted Bridge of Balgie and Ben Lawers. The car park is on the left after about 2 miles. 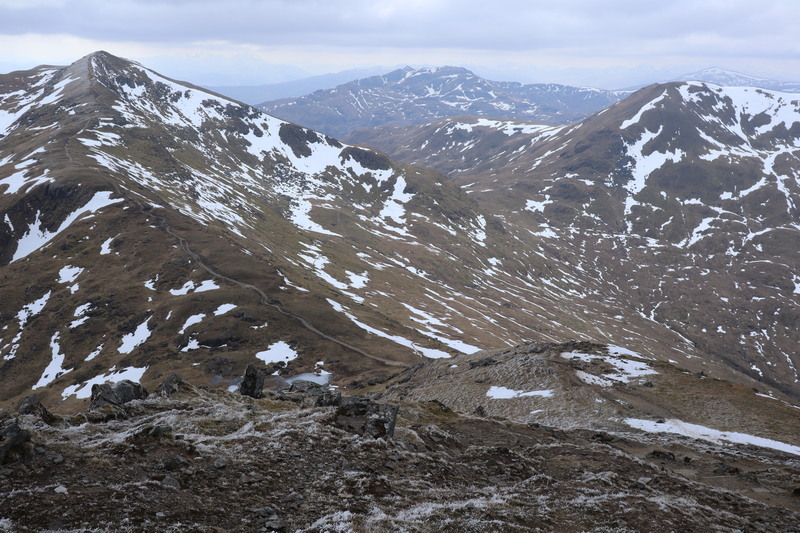 To the west of the road are the “Tarmachan's” and to the east the Ben Lawers group, there are about six munro's here. There's a £2 concessionary parking fee. Ben Lawers itself can't be seen from the car park but the way is obvious as there's a well laid path starting just across the road. The path takes you to a fenced off stream flowing down a small gorge, the Edramucky Burn. I'm not sure whether it was the Irish bank holidays or something but it was the busiest I've ever seen it and everyone seemed to be Irish. The Burn has been fenced off to allow regeneration which seem to be beginning to show results. The path to the Edramucky Burn. 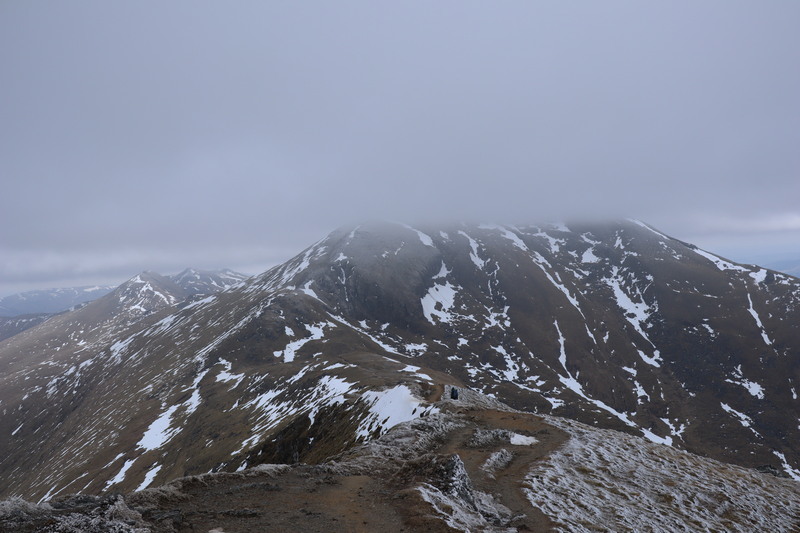 The route goes up the ridge on the right onto Beinn Ghlas. 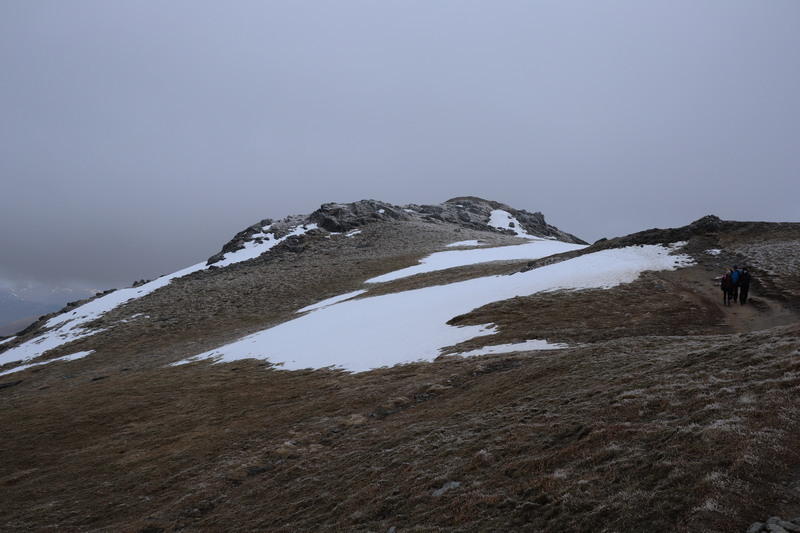 Looking back to Meall nan Tarmachan. The way ahead Beinn Ghlas, it started to get cold up here. 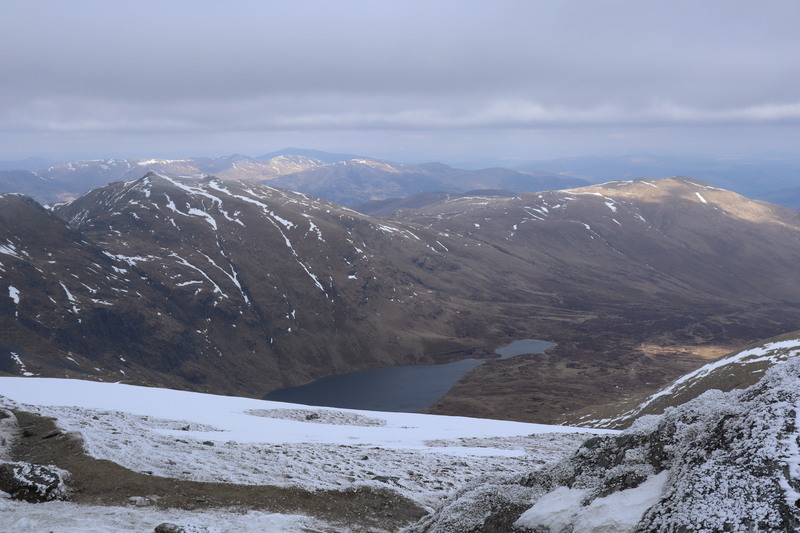 First sight of Ben Lawers from Beinn Ghlas. 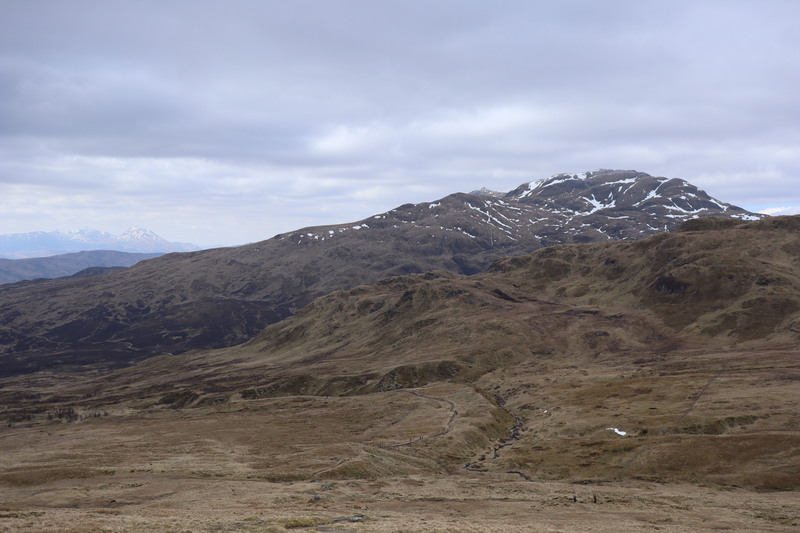 Looking back at Beinn Ghlas on the left with Meall nan Tarmachan in the distance and Meall Corranaich on the right. 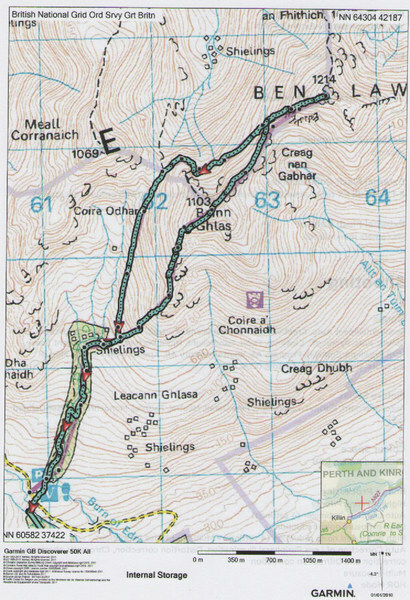 There's a by-pass path across to the col between Beinn Ghlas and Meall Corranaich. Looking down on Lochan nan Cat from the summit of Ben Lawers, I had to sit down and brace myself on a rock to get this shot it was so windy. My original plan was to drop down here and camp by the Lochan. As the wind was blowing straight up the valley I decided to skip the camping this time. 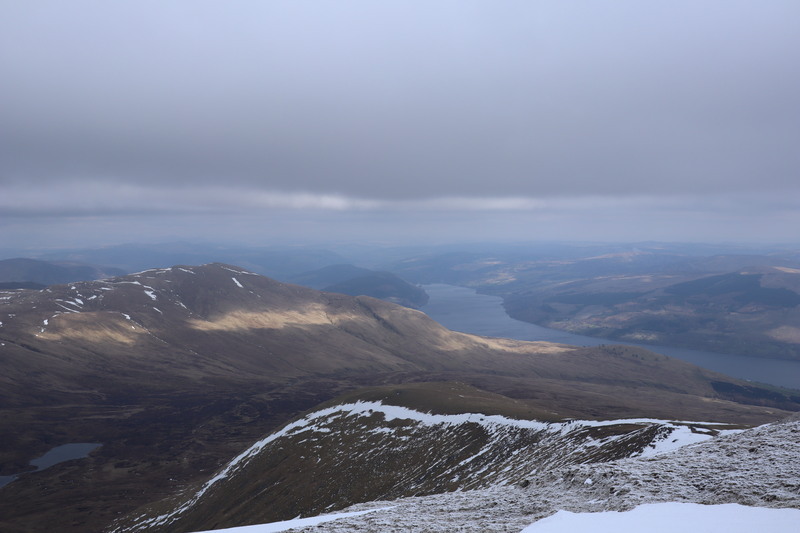 Looking down on Loch Tay. 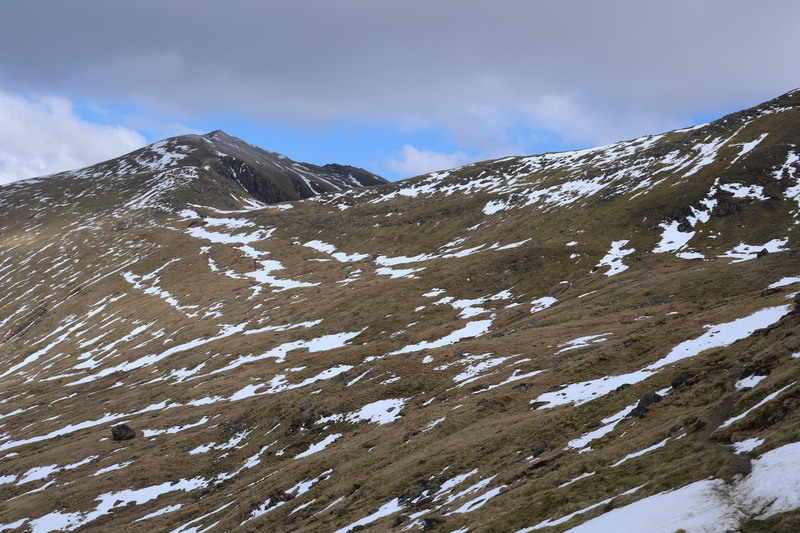 Looking back to Ben Lawers from the by-pass path. Crikey that looks tough going on the map. Good view from the top. If you don't mind sharing, how did you get this picture? Looks better than a screenshot of ViewRanger. Also do you have a gpx file of the trace? Allows me to see a fly through in ViewRanger. Open "Garmin basecamp" download trace from Garmin GPS. Open Photoshop, inport trace as a jpeg. host jpeg on image shack. I would have the gpx file on the garmin, not sure how to send it to you, I'll have to think about it. It took around 5 hours, I was going slow especially downhill as I broke a bone in my ankle and tore my ACL a month ago. I also had kit to camp overnight with me including my heavy winter sleeping bag, about 8kg in all. Looks lovely high level walking - big vistas. 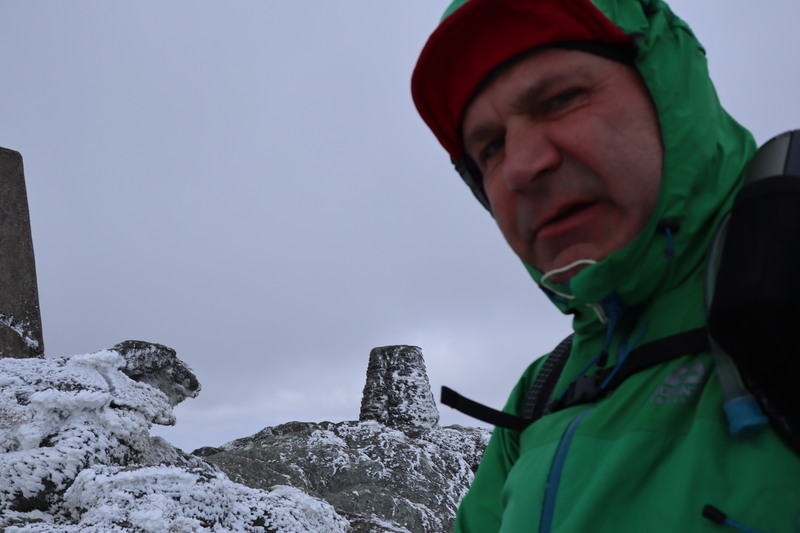 That summit looks cold! Thanks Mel, glad you like them. The ambient temperature wasn't that low around minus two but the wind speeds were in the region of 50 - 60 mph according to the Met. Glad that it went well and that your mending bones were not overstressed, Owen. Lovely wild country that I am not very familiar with. We did drive past Loch Tay on the way back from Lochgoilhead about a month ago, and I was pointing out Ben Lawers to my Munro hungry 12 year old son!